Last month, Anna Macaraig sent me some Novuhair products to try. The 3-in-1 pack contains Novuhair Topical Scalp Lotion, Novuhair Herbal Shampoo and Novuhair Herbal Conditioner. Now I haven’t gone bald yet but I must admit that the stress these past two years have taken a toll on my hair. I have been experiencing excessive hair fall these past months that in no time I am afraid I will have my own landing strip at the top of my head. Anyway, to tell you honestly, this product is totally new to me. In fact I had to search this online and watch Fanny Serrano’s own testimonial video before I start using this. As we all know, Fanny is a widely respected and seasoned salon/hair expert here in the Philippines so his opinion counts. Well, based on his own personal testimony on the effectiveness of Novuhair, it doesn’t only combat hairloss and hair thinning, it also provides optimum nutrition to hair. It rejuvenates hair follicles, improves blood circulation to the scalp, eliminates dandruff, detoxifies scalp and improves scaling. Pretty promising right? But what totally sold me out on the idea of using this product actually is its active natural ingredients. Since my daughter had cancer last year, I am very particular with the products that we use on our body. Good thing Novuhair boasts of natural herbs, essential oils and co-factor nutrients that are proven safe and effective in treating hair problems. Some active natural ingredients that you will find in Novuhair products are: Moringaoleifera / Malunggay / Moringa which helps restore healthy hair. Sweet Almond Oil / Prunusamygdalus, a moisture-rich oil that contains vitamins A, B1, B6 and E, and other essential minerals such as magnesium and iron. These are known to penetrate the scalp to relieve hair dryness and itching, and promote hair nourishment and growth as well. Peppermint, can also be found here which slows down the growth of bacteria and fungi together with Panax Ginseng which improves blood circulation. The Ginger formulation also provides nutrient to hair while the Aloe Barbadensis effectively induces hair growth and prevents hair fall. Lavender aids in relieving itching while Rosemary contains properties that help disinfect and combat dandruff formation on the scalp. And lastly, Lemongrass which controls sebum flow, clean the scalp’s pores, and prevent dandruff too. I am all into juicing and organic stuff so this product complement the kind of healthy lifestyle that we’ve been adapting at home. I am using Novuhair for a month now and I have been seeing great improvements on my hair. I noticed how it has suddenly become much thicker and fuller after continued use. It did add volume and shine to my otherwise dry and limpy hair. There is also a noticeable increase of hair growth too in the area of my scalp that has grown thin so I can personally vouch that it really does wonder. If there’s just one downside to it though, it’s its scent. 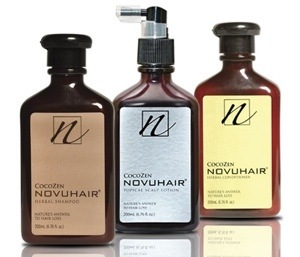 Novuhair scent is nothing like the deep floral scent of most commercial shampoos. Though not really offensive, it is not too pleasant either but then after a while you get used to it. Results were not visible from the first two weeks of application so patience is really the key plus consistency. The 3 in 1 pack contains: Novuhair Scalp Lotion which energizes and rehabilitates the scalp. 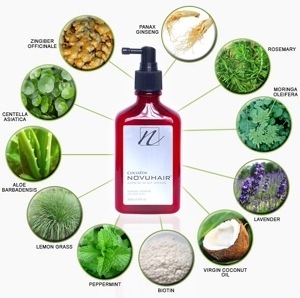 Novuhair Herbal Shampoo which removes build-up that can clog pores and renews the scalp. And Novuhair Herbal Conditioner which restores strength and improves hair elasticity, reducing breakage. I highly recommend Novuhair to people who have been experiencing hair loss and hair thinning or those who just want to restore health and shine to thei crowning glory. The Novuhair 3-in-1 Topical Scalp Lotion, Herbal Shampoo and Herbal Conditioner Pack, come in 200 mL bottles each. These are available as a bundle at all Mercury Drug and Watsons stores with an SRP of PHp 4980. What I truly like about Novuhair is their unrelenting dedication and commitment to their clients, every women in making them beautiful. By that, Novuhair gives their total beauty needs and making sure to bring out the best in you. My friend’s dad hair always looked flat, thin and very oily. After the “Novuhair treatment,” he was amazed as his hair appeared and felt significantly thicker and fuller now. His hair became soft but not without the conditioner. He especially likes that the three products together add shine, add volume, clean thoroughly and lather well. I have given my friend a shampoo cape and her dad is happy with Novuhair and Capes by Sheena’s shampoo cape. My brother needs this oil.. From where I can buy this product and how? I am from India and could not find this product on our stores.. Please tell me where can I find this product? Natural is always the best way to go. It’s great that Novuhair uses only natural ingredients. It’s important to nurture your hair. It pays back in the long run. Thanks for this great review! I know a lot of people are very upset when it comes to hair loss. Because of that reason we did a review on the top 10 best hair loss products. Could you possibly let us know if you would recommend any specific products we could maybe add or remove from our review? Awesome article by the way keep up the good work! We haven’t heard of novuhair before. Great review! I’ve also suffered from hair loss and was able to try this product before. It did provide improvements to my hair fall problem. My only issue is I don’t pretty much like the smell and it takes long for it to go away. It bothered me a little since I have to go to work after using this regimen. I applaud its natural ingredients though and if there’s a chance also the product can somehow add natural fragrances that can improve the smell, it would be way cool! I used the Novuhair CocoZen by the way. Thanks! This product has help my friend over come hair loss. The smell is not important but the fact that this product is very useful and not abhorrent. I really like about Novuhair is their persistent devotion and duty to their customers, each ladies in making them excellent. By that, Novuhair gives their aggregate magnificence needs and making a point to draw out the best in you. Natural is always the best way to go. It’s great that Novuhair uses only natural ingredients. It’s important to nurture your hair. It pays back in the long run. Thanks a lot for giving me an awesome information. Great product. Thanks for the shearing. Organic is always the best way to go. It’s great that Novuhair uses only natural constituent. It’s important to rear your hair. It pays back in the long run. Thanks for this great evaluation! Great! Natural is always the best way to go. It’s great that Novuhair uses only natural ingredients. It’s important to nurture your hair. Thanks for giving me such a wonderful information. Natural is always the best way to go. It’s great that Novuhair uses only natural ingredients. Awesome article by the way keep up the good work! Great work done.It is really good to visit your website .I like the way you have mixture your words and thoughts thanks for sharing . I know a lot of people are very upset when it comes to hair loss. Because of that reason we did a review on the top 10 best hair loss products. Could you possibly let us know if you would recommend any specific products we could maybe add or remove from our review? By the way nice article. I love it. Thanks a lot. Hair loss is chief concern now a days. You share the great post. I really enjoyed it. Thanks for sharing. I heard few times about it, but I was looking for a nice review and i found it. Could you possibly let us know if you would recommend any specific products we could maybe add or remove from our review? By the way nice article. I love it. Thanks a lot. I have your article and its really very good products for hair. Thanks for sharing with us. Its my first visit to your blog and i have found it so useful and informative. Novuhair is the best for hair strengthen as as its every girl’s or boy’s dream to have strong, smooth and shiny hair. Hair loss is chief concern now a days. Dr. Zulfiqar H. Tunio, FRCS, is one of the topmost surgeons, specialized in cosmetic, plastic and hair restorative surgery including Fue Hair Transplant. He has been performing hair transplant surgeries for more then a decade. He has carried out more then 15,000 successful hair transplants with the highest success rate. Looks like a pretty great product. Thanks for the article! Great product! I’ve also suffered from hair loss and was able to try this product before. It did provide improvements to my hair fall problem. Nice article and very informative. I heard great things about Nouvuhair and will surely share this to my friend.. Nature is Best Healer, It’s great that Novuhair uses only natural ingredients. I just land on your blog through Google, I read many posts of your blog and I found is very informative! 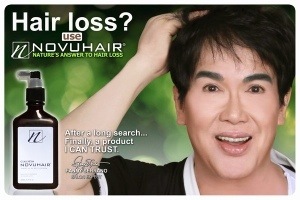 Novu hair is a great product especially for hair loss. I particulary like the lemon tree extract included as its good for heathy hair. such a great article admin thanks for sharing with us. is it available in asia like india? Hi, very informative and knowledgeable article. Thanks for sharing.